Following the installation of SharePoint 2010 SP2 (KB2687453) I found that the RSS viewer web part had stopped working; the web part continually showed the loading image. After some research I discovered that the issue was introduced in SharePoint 2010 February 12, 2013 cumulative update (KB2767793). Some suggested fixes are listed on the SharePoint forums. The second option is to add the above script to the SharePoint master page, but I couldn’t get this to work. The third option is to turn off web page security validation for the web application from Central Administration -> Manage web applications. Highlight the affected web application and select General Settings from the ribbon. Turning off web page security validation worked, but I was then unable to create any new sites or lists because I received the error “An unhandled exception occured in the Silverlight application SharePoint 2010. I have just finished testing the August 13, 2013 cumulative update for SharePoint 2010 (KB2817570) and it appears to fix the RSS viewer issue without any side affects. Following an upgrade from SharePoint 2010 to 2013 I deployed some custom web parts. When loading the page I received the error “/_CONTROLTEMPLATES/WEBPARTNAME/VisualWebPart1/VisualWebPart1UserControl.ascx” does not exist. Change the string to include the 15 folder. Rebuild and re-deploy the web part. This entry was posted in SharePoint and tagged Microsoft SharePoint, SharePoint 2010, Upgrade, Web part on October 4, 2013 by richardstk. One of the great features of SharePoint 2013 is User License Enforcement. This enables you to map users, or Active Directory security groups to a SharePoint license level. User License Enforcement is disabled by default and is dependent on Claims authentication. However, Claims authentication is the default in SharePoint 2013 http://technet.microsoft.com/en-us/library/cc262350.aspx. 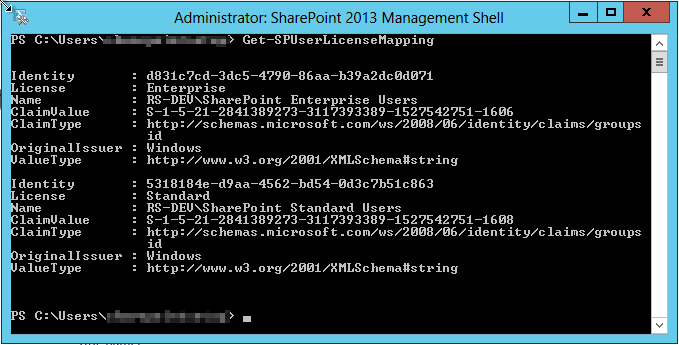 To enable User License Enforcement, open the SharePoint 2013 Management Shell and type Enable-SPUserLicensing. To confirm User Licensing is enabled type Get-SPUserLicensing. Enabled, True should be the output if it’s enabled. Replace Enterprise with either “Standard”, “Project”, “DUET”, or “WAC” depending on the license level you wish to enable. Project is for Office Project Server, DUET is for SAP and WAC is for edit rights in Office Web Apps. In the screenshot below I’ve mapped two Active Directory security groups to different license levels, one to an Enterprise license and one to a Standard license. 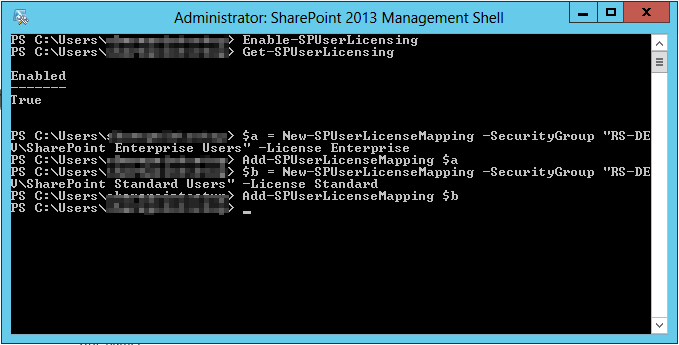 Once you have configured the license mapping, enter Get-SPUserLicenseMapping to view the mappings. Once the User License Enforcement has been configured users will see a different view dependent on their license level. Below you can see a user mapped to an Enterprise license can create sites, such as Business Intelligence Center. The user in the screenshot below is mapped to a Standard license and has a different set of site creation options. If a user with a Standard license accesses a page containing an Enterprise level web part they may see an error relating to a lack of license. This entry was posted in SharePoint and tagged Active Directory, Microsoft SharePoint, SharePoint, SharePoint 2013, Web part, Windows PowerShell on July 18, 2013 by richardstk. If you develop, release and add a SharePoint 2010 sandboxed solution web part to a page, then change the web part type to non-sandboxed you may see the error: ” Web Part Error: The request could not be completed because the specified solution was not found”. Just edit the page, delete the web part, then re-add the web part to the page. This fixes the error. This entry was posted in SharePoint and tagged Microsoft, SharePoint 2010, Web part on August 6, 2012 by richardstk. During the development of a Silverlight web part for SharePoint 2010, I found that the drop down navigation menus were hidden behind the web part. To fix the issue, set the z-index to 0 and add a parameter for windowless and set the value to true.